So DC released collections of Jiro Kuwata's Batman stories, but there were a few issues with the translation. Is it just me or does that seem like a very un-Batmany thing to say? I know Batman is a character who's been in lot's of different types of stories and can been interpreted in many different ways, but it seems off to me. Also to be honest there are some parts of the translation, which seem a bit amateurish, or maybe they didn't have enough time to do ii properly. Weird Batman quotations is not a new thing!! At least it's not a stilted " Planet King.. so annoying! " translation. 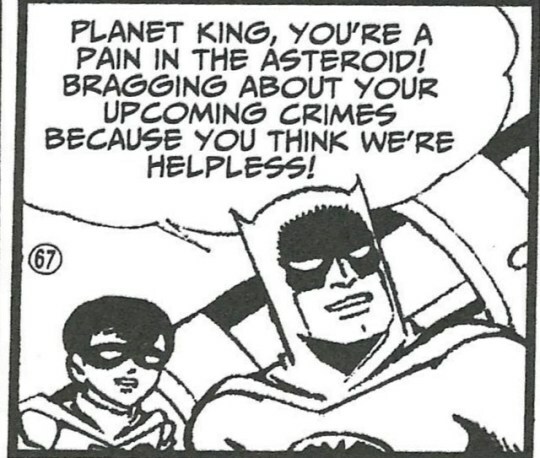 I mean, it's a little bit naughtier than I would expect from the Adam West Batman (although after watching Batman vs Two-Face, I do have to recalibrate that measure), but an awful pun is exactly what I would expect from a Batman that looked like that. If anyone has a scan of the original, I can compare the translation.